Building Information Modeling, an innovative modeling method, displays blueprints clearly in three dimensions and provides additional information such as technical specifications and requirements, building costs and timeframes. Its main advantage is that all the various data sources are digital, so information can be merged coherently into joint models. Researchers will be presenting their projects on BIM at the Fraunhofer Building Innovation Alliance’s special show, “Fraunhofer CityLaboratory – Creating Living Spaces,” at the BAU trade fair in Munich from January 16 to 21, 2017 (Hall C2, Booth 538). Building Information Modeling, BIM for short, is a new construction planning method. BIM creates digital building plans with detailed information. All the various data sources are digital, so information can be merged into joint models. This speeds up building projects. Fraunhofer Building Innovation Alliance researchers will be presenting their projects on BIM at the BAU trade fair in Munich from January 16 to 21, 2017 (Hall C2, Booth 538). Architects, bricklayers, plumbers, pipe fitters – tradesmen of all sorts work together on building construction. This variety means that coordinating work isn’t always easy, as domain-specific plans are hard to understand for others, leading to errors and delays. Building Information Modeling (BIM) simplifies work coordination by integrating all data into a three-dimensional model, adding details of technical requirements, building costs or timeframes, and storing it all centrally. In this way, all project participants can be sure that they are referring to the same, up-to-date architectural plan for their work. As a result, planning is coordinated, decisions are made more transparent and construction is quicker, more accurate and more cost-efficient. A wide variety of additional information can be attached to individual construction components, for example fire protection data, energy characteristics, data from life cycle analyses, manufacturer details, assembly instructions, operating characteristics or maintenance intervals. Each component can have additional information associated with it. “BIM effectively creates a digital twin of the building,” says Peter Noisten, project manager at the Fraunhofer Institute for Building Physics IBP. This enables project participants to visualize the nascent building better and earlier and to make more informed decisions, resulting in more accurate planning and a decreased error count. Researchers from the Fraunhofer Institutes for Building Physics IBP and Industrial Engineering IAO aim to promote this planning method in Germany by gathering practical experience and generating recommendations. To this end, they are collaborating with various partners in the “BIM Reference Project in Germany BIMiD” project, which is focused on two construction projects funded by the German Federal Ministry for Economic Affairs and Energy: a Volkswagen Financial Services building in Braunschweig and the Pionierkaserne office complex in Ingolstadt. A reference process – developed by Fraunhofer IBP together with AEC 3 Deutschland GmbH and approved by the architects and engineers association AHO e.V. – maps out the main building development stages according to HOAI, Germany’s official Fee Regulation for Architects and Engineers, in chronological order from the initial concept to a building’s dismantling. This reference process is available online since May 2016; Fraunhofer IBP will use it in construction projects receiving the institute’s support as a tool to help builders and planners as well as facility managers during the introduction of the BIM method. “Decision-makers are convinced of the benefits of BIM,” says Noisten. “Not only does it let them make important decisions much earlier on than before, but those decision makers are also much better informed.” Günter Wenzel, head of department at the Fraunhofer Institute for Industrial Engineering IAO, elaborates: “BIM is extremely effective when experts get together to compare notes, too. 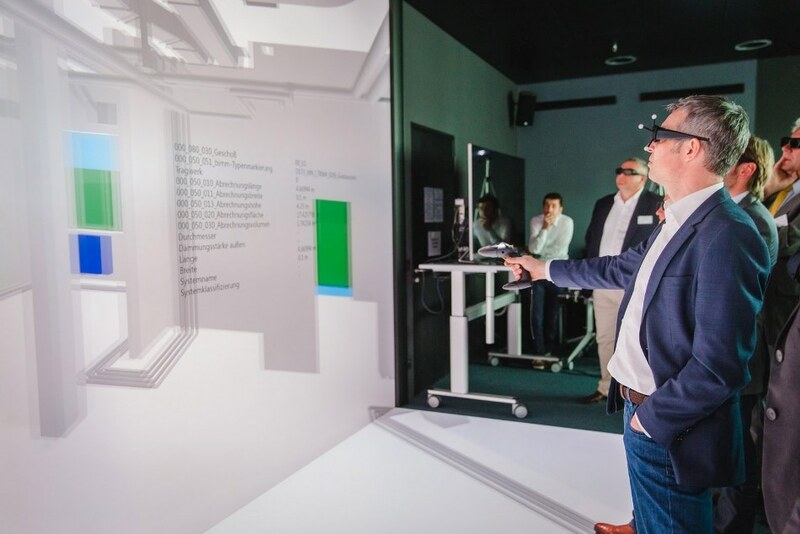 Construction professionals stand together in a CAVE projection room for an immersive virtual reality simulation, where the technology lets them experience the latest planning status naturally and intuitively, with no laborious explanations necessary. This notably increases efficiency – issues that previously required two or three meetings to resolve can now be completed with just one. Having a “digital twin” of a building presents advantages that prove useful far beyond the normal construction planning process. For example, Fraunhofer IBP researchers use the virtual plans to simulate and optimize indoor climate, acoustics and energy use and optimize them – long before the foundation stone is laid. “Until now engineers were obliged to reenter data from the plans manually into other software. With BIM, we can plug data directly into a simulation,” says Noisten. To date, smaller trades such as pipe fitters have not been able to benefit from BIM’s advantages, as the relevant software was too expensive to be profitable for them. Instead they have continued with their previous planning methods. The problem is, their current software is not compatible with BIM software, so pipe fitting companies are left without access to the overall plan and any changes to it must be sent to them separately. Breaks in communication of this sort are a frequent cause of building errors. Researchers at the Fraunhofer Institute for Factory Operation and Automation IFF in Magdeburg seek to fill this gap with their IT project BAU ZEIT, with a view to smoothing the path to BIM for small and medium-sized enterprises. “We’re integrating common planning tools such as MS Project and Excel into BIM software,” explains Stefanie Kabelitz, a scientist at Fraunhofer IFF. “Communication will become easier, planning effort will decrease and costs will fall. We expect individual parties to save up to 30 percent of working time.” The BAU ZEIT tool collects all information in a central database and communicates any changes to all the different participants. BIM isn’t just good news for construction professionals: “laypersons” also benefit from BIM. It allows a building’s future users to connect with the project early on – doctors monitoring the construction of a clinic for example. Digital imaging serves here as a comprehensible visualization tool. It also helps citizens connect with public building projects, as researchers at Fraunhofer IAO found out working with communication scientists from the University of Hohenheim on the VisB+ project. Previously, many taxpayers had the feeling that they were only presented with beautified versions of draft designs for planned construction projects, rather than realistic designs. BIM now makes it possible for members of the public to view the current planning status of a project as an intuitive and credible 1:1 virtual model. Researchers from Fraunhofer IAO, Fraunhofer IFF and Fraunhofer IBP will be presenting their projects relating to BIM at the BAU trade fair in Munich from January 16 to 21, 2017 (Hall C2, Booth 538). The institutes will continue to promote the three-dimensional planning method in the future, too: the new “BIM at Fraunhofer” project will see them introduce the tool in the Fraunhofer construction division, and will use it in a selected construction project.